Life & Times – Page 345 – deutsch, bitte! Last night I went to see Leonhard Thoma speak at my university. He was brought in by the Goethe Institute and we were fortunate enough to have him stop in and do his thing for our group of nearly 50 people in between other engagements. Seeing as it was a Tuesday evening and these days are reserved for myself, I was reluctant to make the 30-minute trek out of town to school, but in retrospect, I’m so glad that I did. As for Herr Thoma, I cannot say enough good things about this man. For people who don’t know anything about him, he is a German professor (in Spain) and an author, but the catch is, his stories are written for German learners (like myself) and structured to facilitate and foster language acquisition and understanding. Of course, I had my doubts, but they quickly disappeared once he began speaking. I don’t know much about his research or methodology, but he has clearly figured out a very effective means of writing and communicating and I was more than impressed. Furthermore, his presentation lasted for an hour-and-a-half and I daresay that I understood everything he said save for a handful of words every five minutes or so. When it ended, I left both entertained and inspired. Unfortunately, I also left my Nalgene in the room, a fact I didn’t realize until I was back home. This was particularly frustrating because it was my second time forgetting my Nalgene. The first time was last Fall when I happened to forget it in a lecture hall and never saw it again. Now I realize Nalgenes are a dime a dozen. Or, you know, 10 bucks a pop if you’re aiming for specificity. But I get unnecessarily attached to mine, because it’s part of my daily ensemble. 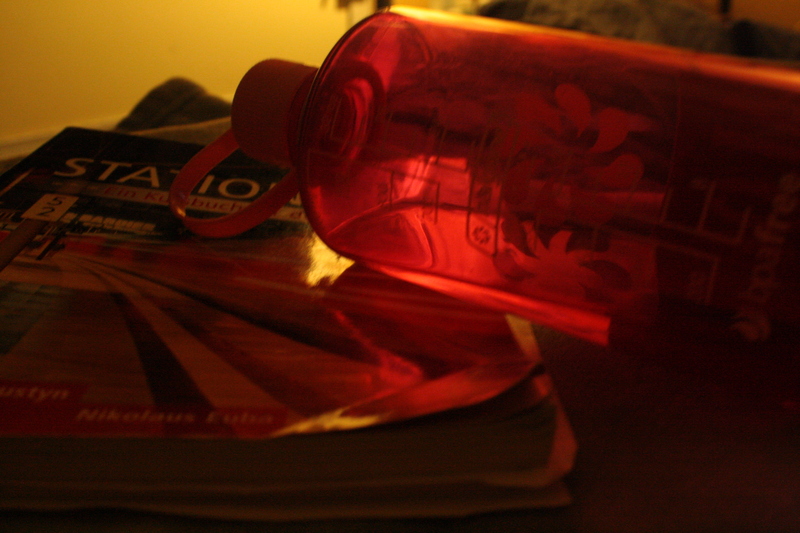 Along with my cell phone and my sunglasses, my Nalgene is an everyday essential. So forgetting it made me a little bit unnerved. This time around though, I got lucky, because the first class of the day today was German, in that very same room. And as I entered the classroom, I looked to the left of the door where I had been sitting the evening before, and there was my Nalgene, propped up on the chalk tray. With one less thing to worry about, I could focus on the German. And good thing, because today took a lot out of me. Learning German makes me feel like I’m a freshman in high school, crushing on the unattainable senior. Sometimes I see him in the halls, and maybe he’ll smile at me, and those moments are euphoric. But most of the time, there’s the earth-crushing reality that he’s totally out of my league. Thank goodness for hope.